> 12 ATO blade fuses plus 2 additional 30 Amp ATO fuse positions for the radiator fans. 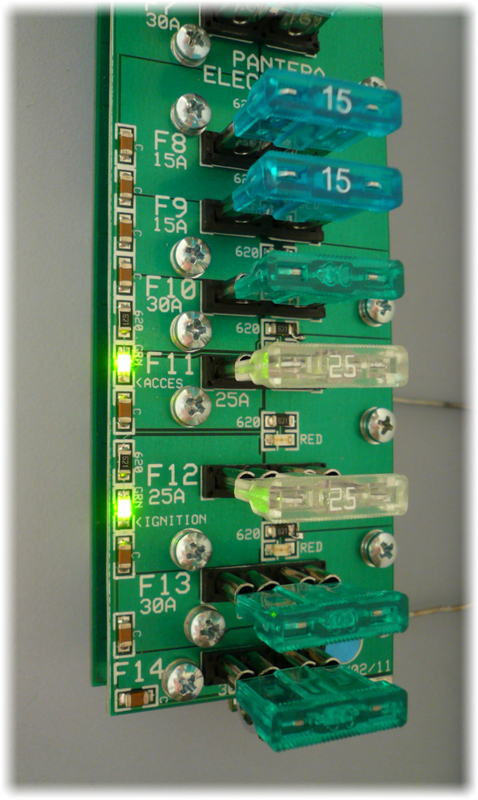 > ATO Fuse Panel includes fuse panel with fuses installed. > Rugged open frame construction to dissipate heat, built with high quality non-flammable materials, aluminum, copper, brass, glass impregnated fiber board. > Mounting foot print is longer and will require drill and tap 1 hole. > Quick disconnect terminals are labeled with wire color and function to help de-bug wiring problems. > ATO fuses are labeled on the fuse panel with circuit number and current rating. > Each fuse has a red LED indicator for "open" fuse condition. (note that the protected load must be active or "ON" for the LED to operate) > Quick disconnect terminals are geometrically positioned similar to the factory fuse panel, transferring one wire at a time to minimize installation problems. "EXTRA" terminals marked for an additional accessories. > Electronic noise suppression devices for each fused circuit to minimize electrical noise from car stereo systems. > ATO automotive fuses were designed for the automotive industry and are readily available in Europe, Canada and U.S.A.
Fuse Panel Indicators The Mangusta electrical system is monitored on the input power to the fuse panel before distribution. "Accessories" position green indicator for the key switch power “ON” "Ignition" position green indicator for the key switch power “ON”. Each fuse has a red LED indicator for "OPEN" fuse condition. 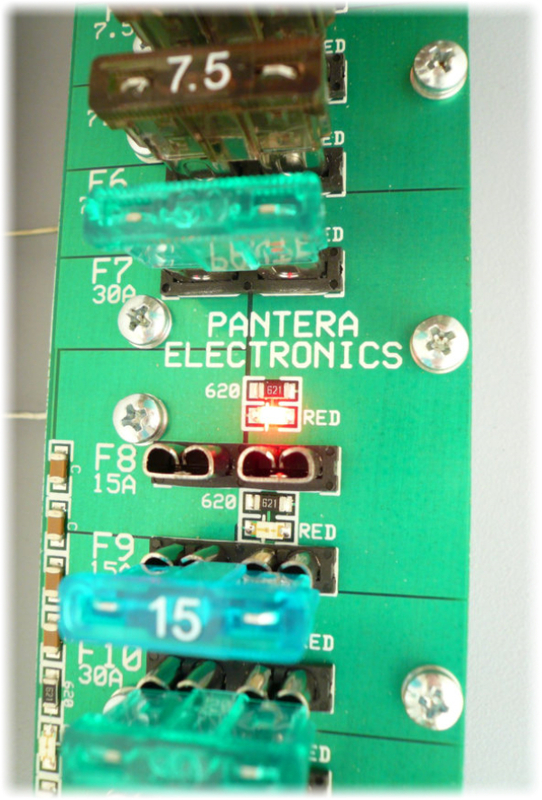 Replace this Mangusta fuse panel with the Pantera-Electronics Mangusta fuse panel for reliability and safety.